this all stainless steel stove weighs in at 220 grams empty. burner capacity is 4 ounces. 18ml of methyl hydrate boils 2 cups in 9:00 with flame out at 12:15.
i also tested it with a full 4 ounces of fuel. it boiled 2c in 9:30 useing 20ml of fuel. this was checked by weight and may not be accurate. 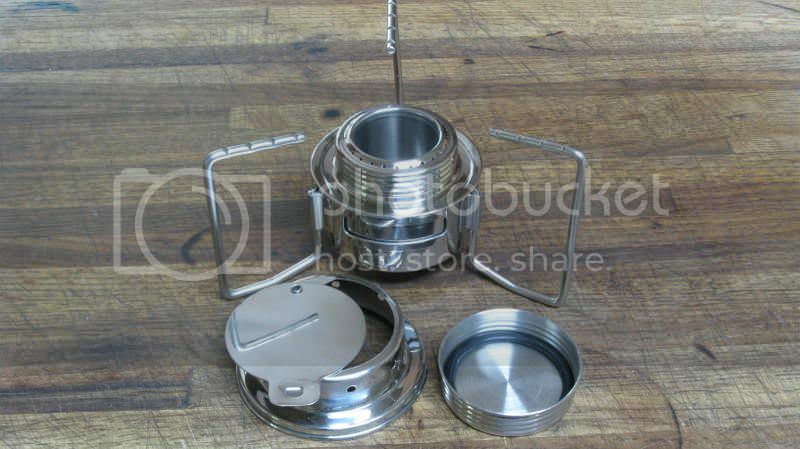 the ability to carry 4oz of fuel sealed in the burner is great for just a couple nights out. it's a bit on the heavy side for backpacking, but for kayaking that's not that important. the fact that it is all s/s is a great boon for us saltwater campers. the threads on the lid could be a little tighter, but it seals nicely on the rubber o-ring. the potstand is quite stable. 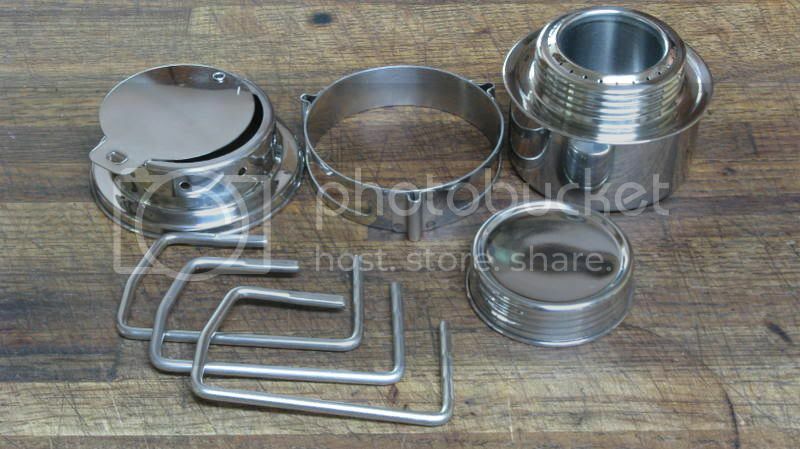 the burner, stand, and simmer cap are sold seperately and came to a total of only 25 bucks. i think it's a very usable stove, and the mirror polished finish is beautiful! two thumbs up!! Oops, you don't have one? i got mine from a small local shop. no website. a google turned up some euopean sites but i coulndn't find anything in north america. Yep i found too but like to get here in usa. in C C C Canada. more efficiently than the trangia. so it is a trangia now. Great information on the efficiency of the Totonka. Looks like a set of legs can be made just like the Simon stove to fit the Totonka and be able to pack better, what are your thoughts? "designed in Germany,produced in Viet Nam"..doesn't appear to be sold on this side of the world..
You can buy the burner pretty cheap here.